If you have realized that the man in your life is having a negative influence on your attempts to follow a healthy diet and lifestyle then Jenna Bergen, a freelance writer and yoga enthusiast, has some words of advice to offer. In her book, Your Big Fat Boyfriend: How to stay thin when dating a diet disaster, Bergen draws on personal experience with her own “big fat boyfriend”. She offers women practical suggestions and tips on how to avoid gaining weight while dating a guy who has less than ideal eating habits. Studies show that women who are in a relationship almost always gain weight due to changes that occur in their diet and exercise routines. However, it is possible to avoid this tendency by being aware and incorporating some simple strategies. Your Big Fat Boyfriend highlights the differences between male and female metabolism and explains why women can’t eat like their boyfriends and expect to stay thin. Instead of offering a specific diet plan she gives suggestions on how to make healthy food choices while ensuring that your relationship remains harmonious. Women are provided with advice on how to eat out including how to deal with situations such as when your boyfriend insists on eating dinner at a fast food restaurant. The book also includes a selection of healthy recipes that taste great so that both you and your boyfriend can enjoy them while you maintain your healthy lifestyle. Fruit, vegetables, oatmeal, rice, chicken, beef, bacon, egg whites, seafood, agave, stevia, olives, herbs, spices, chicken broth, dark chocolate, low fat salad dressing, salsa, hummus, pickles, baked corn chips. Your Big Fat Boyfriend includes a guide to working out and also gives advice on how to stay active when your boyfriend doesn’t want to go to the gym. 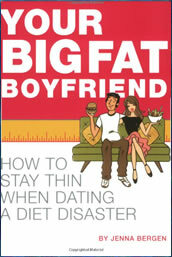 Your Big Fat Boyfriend: How to Stay Thin When Dating a Diet Disaster retails at $14.95. Includes unique advice that applies to the lifestyles of young women. Recommendations are flexible and practical. Includes healthy recipes that will appeal to men and women. Includes tips for eating out. Will not appeal to readers outside of the target audience. Bergen’s book presents a humorous and practical approach that will help women to maintain a healthy lifestyle while dating a guy who doesn’t place a great deal of attention on healthy eating. By following the advice in this book women will find it easier to maintain a slim figure without alienating their boyfriends with ‘diet foods’ and rigid fitness routines. It is quite possible that reader’s boyfriends will also lose weight and become healthier as women incorporate the suggestions for increasing physical activity and prepare the healthy low fat recipes that are included in Your Big Fat Boyfriend. The guy I am seeing is very fat. How can I make him feel better or wanted?